SCHAUMBURG, IL (September 2018) – HEIDENHAIN’s top-of-the-line lathe control, the CNC PILOT 640, has been impressing customers for many years with its numerous advantages and is now available with even newer upgrades. Most notably, a new TURN PLUS feature is now standard on new purchases that allows the creation of a lathe program by the push of a button with up to 90%-time savings. The new versions of the control software also include other improvements such as added Functional Safety (FS) features and expansions that provide the machine operator and the machine tool builder with more benefits. The CNC PILOT 640 contouring control is perfect for lathe applications of complex parts as it combines simple operation with reliable, high quality series production. It allows 5-axis simultaneous machining and combined turn-mill operation, full surface machining with B axis and counter spindle, as well as up to 3 channels for asynchronous multi-side machining. Multitouch operation allows swiping and zooming in and out, and high resolution 3-D simulation graphics have been added. Machining operations with one or several setups (multi-channel operation) can be programmed separately through structured programming. The maximum number of controlled axes and spindles has been increased to 24 using appropriate options. 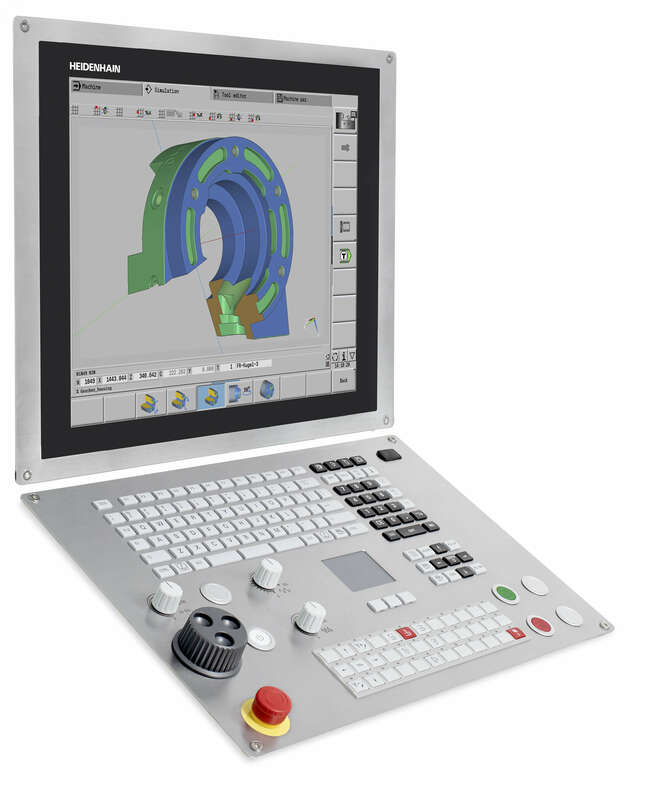 The CNC PILOT 640 lathe control is available with two screen formats: 19“and 15.6“ with up to 25 configurable fields. It also now works with HEIDENHAIN’s display handwheels HR 520 (FS) and the HR 550 FS radio handwheel system. New CFRCompactFlash memory cards and SIKs are also available. For those interested in connected machining, the CNC PILOT 640 can be incorporated into such systems by utilizing HEIDENHAIN options Remote Desktop Manager (option 133) and StateMonitor for capturing machining data.